Blue-winged teal are small dabblers. The males have a blue-gray head with a bold white crescent between the eye and bill. The pale blue forewing patch is the best field mark of a blue-winged teal, as drakes are usually in eclipse plumage until January or longer. Blue-winged teal have an average length of 16 inches and an average weight of 15 ounces. Blue-winged teal can be found across all four flyways. They are the first migrants to arrive in South Carolina, usually in late August and early September. After staying a short while, most teal move on to wintering grounds further south. 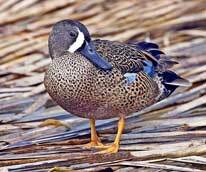 Teal summer habitat includes shallow ponds and marshes in the Prairie Pothole Region of the Great Plains. During the winter they are found in fresh or brackish waters, typically in vegetated wetlands and managed impoundments. Teal consume a wide variety of food including seeds, vegetative parts of aquatic plants, duckweeds, aquatic invertebrates, and occasionally grains from agricultural crops. Mating pairs are formed before arriving on the breeding grounds, most likely during spring migration. The female blue-winged teal nests in upland habitat where her nest can be concealed. Her nest consists of a depression on the ground lined with grass and feathers. Once her nest is constructed she lays 6-14 creamy white eggs. 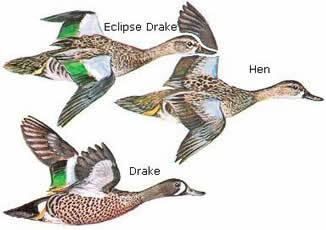 Drakes have a whistling peep, and hens utter a low quack. More vocal than most ducks—their high-pitched peeping and nasal quacking is commonly heard in spring and to a lesser extent in fall. Among the first ducks to migrate each fall, and one of the last to leave in the spring. 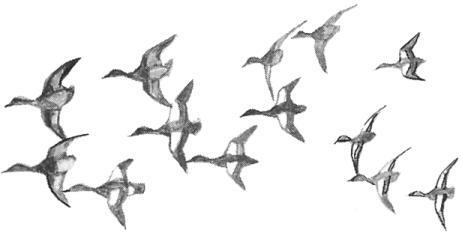 Fly low over marshes in small, compact flocks and often take the hunter by surprise. Walk and run well on land and rarely dive while swimming. Strongly territoriality during the breeding season and are intolerant of other males. Outside of the breeding season, teal are highly social and are often associated with mixed flocks.